Tips for Feeding Your Adult Cat – The Do’s and Don’ts! - Petpav - Your Online Magazine for All Things Pet! Tips for Feeding Your Adult Cat – The Do’s and Don’ts! As our cats reach adulthood, from the ages of two to eight, their needs change from when they were mere kittens. Each cat has his or her own set of quirks and preferences and as your cat gets older, you will get to know what makes them well ‘meow’ and fit. As they graduate from kitty-hood, so does their energy level and it is important to cater your cat’s feeding accordingly. The below are some general tips to help your cat thrive during adulthood. Adult cats should eat enough of a high-quality, nutritious food to meet their energy needs and to maintain and repair body tissues. The amount you feed your adult cat should be based on his or her size and energy output. Cats vary widely in their activity levels. A cat with a relatively normal activity level should eat enough to maintain his energy level. Most food labels are accurate in feeding amounts and you can adjust accordingly depending on the activity level of your cat. Contrary to popular belief, milk should not be fed to cats as a treat or a substitute for water. Cats do not possess significant amounts of lactase, the enzyme that breaks down lactose in milk. Feeding milk and milk-based products to cats can actually cause them to vomit or have diarrhea, especially upon reaching adulthood. Since we don’t take our cats for outdoor walks (although some people do), it is important to make sure they stay active during the day. If you are gone all day, leave interactive toys, or something to keep your cat stimulated. When you get home, play with your kitty and get him up and off the couch! We don’t want our kitties to become overweight and have the health issues that accompany an overweight cat such as diabetes. Unless advised otherwise by your vet, your cat should always have free access to fresh, clean water. Water bowls should be cleaned every day to keep it appealing to your furry kitties. As with people, extreme hot or cold weather can increase a kitty’s energy needs. Both keeping warm and keeping cool use up extra energy, so you may wish to consult with your vet about what to do when the temperatures become very hot or very cold. Indoor cats are still affected by extreme weather. Cat owners should always consult with their veterinarians to determine the best feeding schedule and types of food for their cats. However, as a general rule, it is recommended that all cats be fed twice a day using the portion control feeding method. Simply divide the amount suggested on the label of your cat’s food into two meals, spaced eight to twelve hours apart. You may need to adjust portions as you learn your cat’s ideal daily “maintenance” amount. 1. Portion-control feeding which entails measuring your cat’s food and offering it as a meal, thereby controlling the amount of food that can be consumed. This method is used for weight control programs and for cats who might overeat if fed free-choice. Food can be provided in one or more meals daily. 2. Free-choice feeding is also known as free feeding when you have dry food available at all times, as much and whenever your kitty wants it. 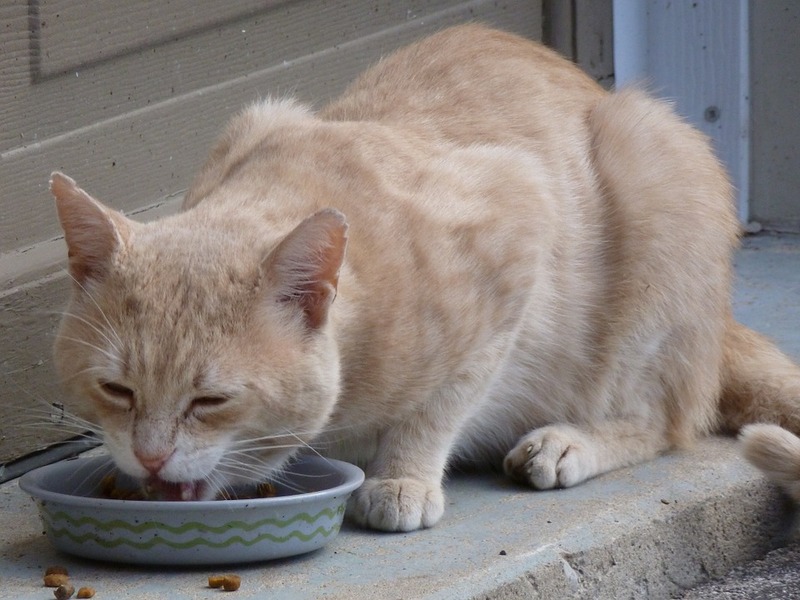 This method is more appropriate when feeding dry food, which will not spoil if left out. However, some cats will overeat when fed free-choice, which can result in obesity so keep an eye of your kitty’s weight if you decide to use this method. We all love to give our cats treats. However, treats should be given in moderation and should represent less than five percent of a cat’s daily food intake. The rest should come from a nutritionally complete cat food. And the same goes for ‘human’ food. Make sure to give your kitty protein pieces in moderation, if at all, to see how your cat reacts to it and that your cat can digest it fully. If you feed your cat a healthy diet with a high quality cat food, give your kitty plenty of water, and make sure your adult cat is stimulated with play and/or toys, your adult cat will thrive.